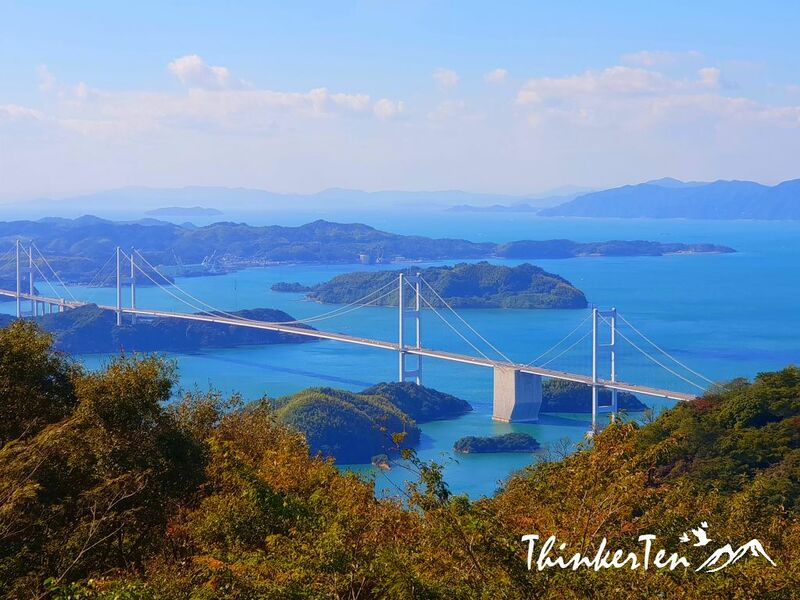 Shimanami Kaido is a spectacular 60-70 kilometer road-and-bridge network connecting Japan’s main island of Honshu with Shikoku, passing over 6 small islands in the Seto Inland Sea 瀬戸内海. 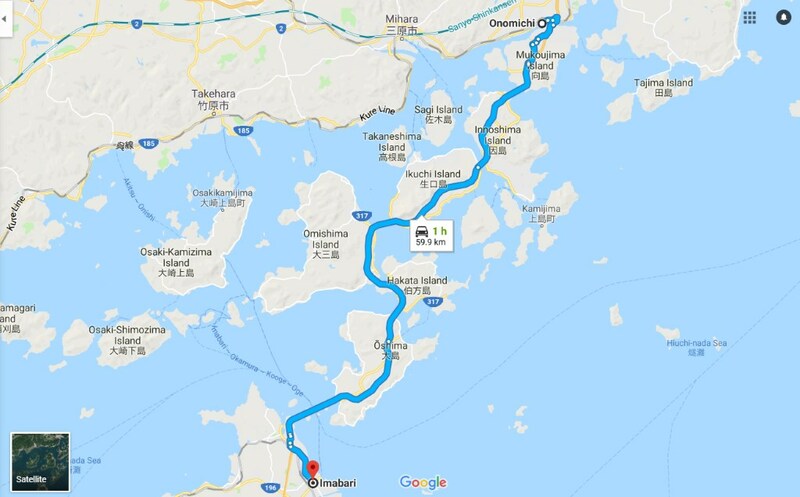 The starting point of Shimanami Kaido is in Honshu 本州 Island in Onomichi 尾道 city and end at Imabari 今治 City in Shikoku 四国 Island. Shimanami Kaido will link the 6 islands of Mukaishima 向島, Innoshima 因島, Ikuchijima 生口島, Omishima 大三島, Hakatajima 伯方島 and Oshima 大島 together with the modern and attractive bridges. Actually each bridge that links the islands has its own name, but all together they are called Shimanami Kaido. My high school classmate Lynn (we used to call her Xian Chin in school) happened to do her cycling trip at Shimanami Kaido in Shikoku when I was there. We connected through phone and chat a little while in Japan. 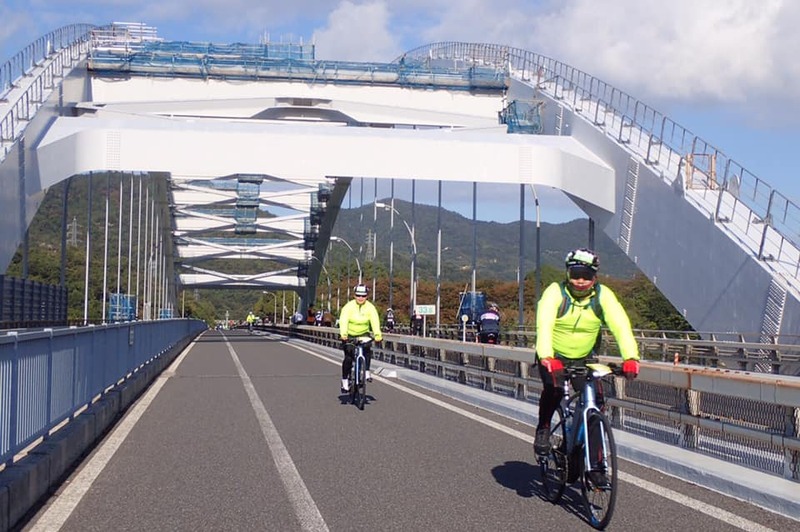 Since Shimanami Kaido is a very popular route for the cyclists around the world, I had conducted a little interview with her from an experience cyclist to learn more about this fascinating route in Japan from a perspective of a cyclist. My experience of Shimanami Kaido is only by car, self driving which is very much different from the cyclists as this route is not only made for car but also specially made for cyclists. When they build the route, the purposely have a cyclist path made solely for the cyclists. 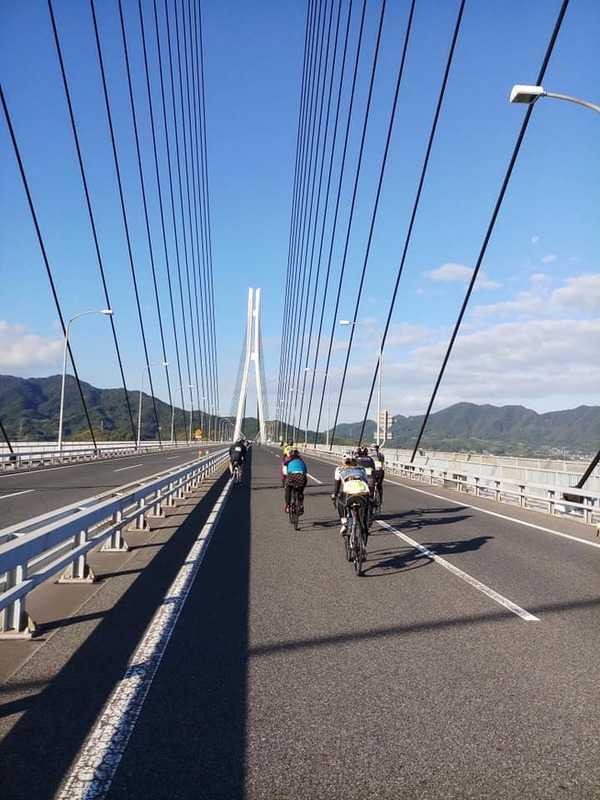 I think anyone who wanted to get the most out from Shimanami Kaido, cycling through the 70km through different type of bridges is the way to enjoy the remarkable scenery. 1. Are you flying in from Melbourne Australia? Ans : Sort of, I was on my business trip in HK/Taiwan then flew from there to Hiroshima Japan. 2. What cycling group do you join? 3. How long is the whole duration? Ans : Total is 5 days. 4. Where is your starting point for Shimanami Kaido? I know some start from Onomichi or Imabari. 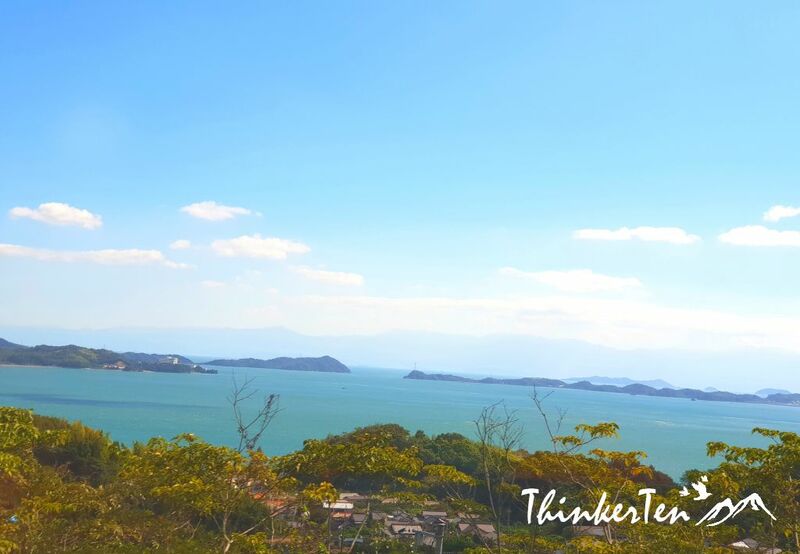 Ans : We started from Onomichi and took a short ferry over to the park starting point and end at Imabari. 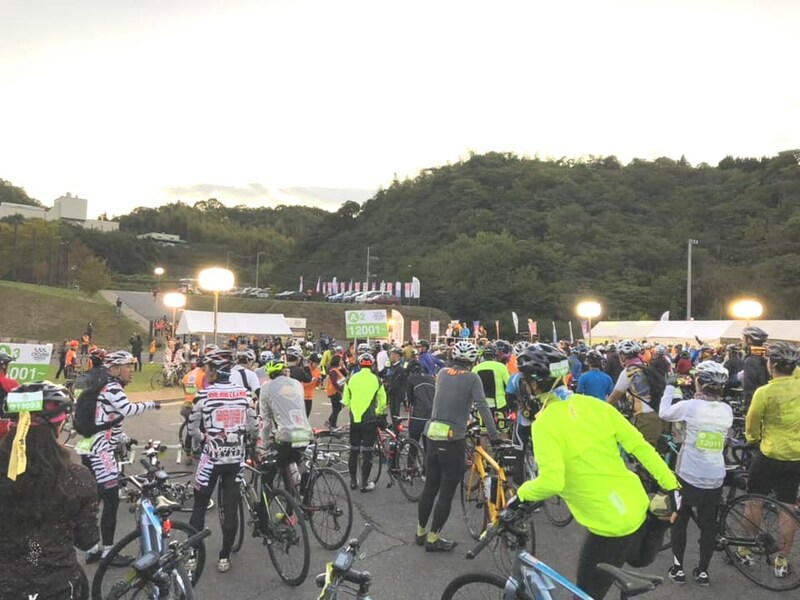 There are in total 8,000 participants in this cycling event and 7,000 start from Imabari. 5. What kind of bikes are you using? 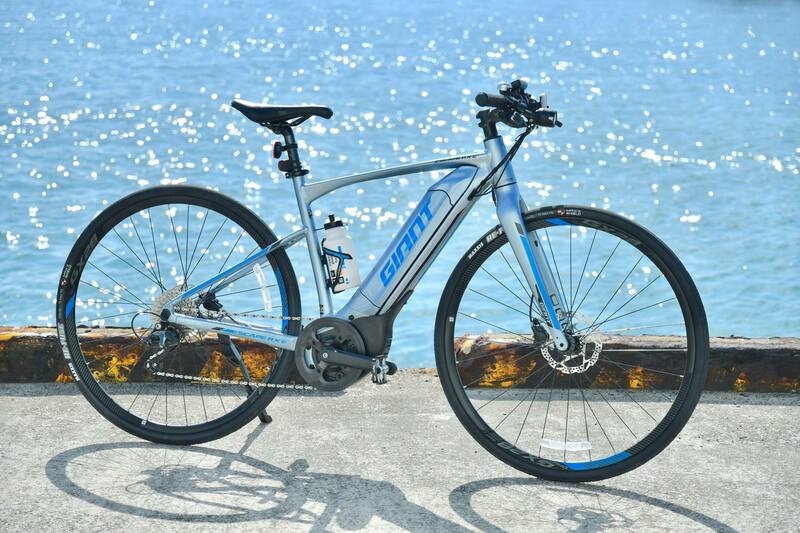 Ans :The new electric bike model to be launched their Giant Escape RXE. 6. Do you have to assemble your own bike if you prefer to use your own bike? Ans : Yes, we have Giant technician with us to help us to assemble with our personal bike. 7. Where do you stay during the cycling tour? 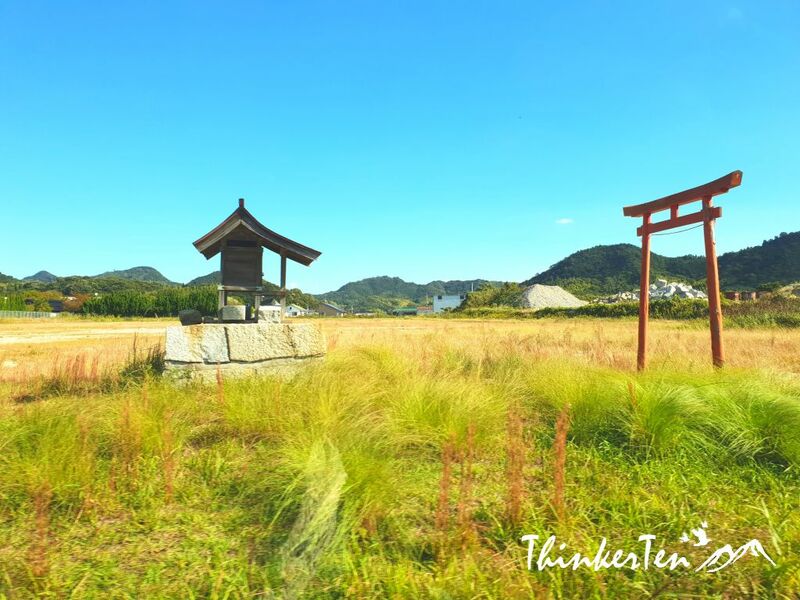 Ans : Onomichi U2 Hotel Cycle & Imabari Kokusai Hotel. 8. 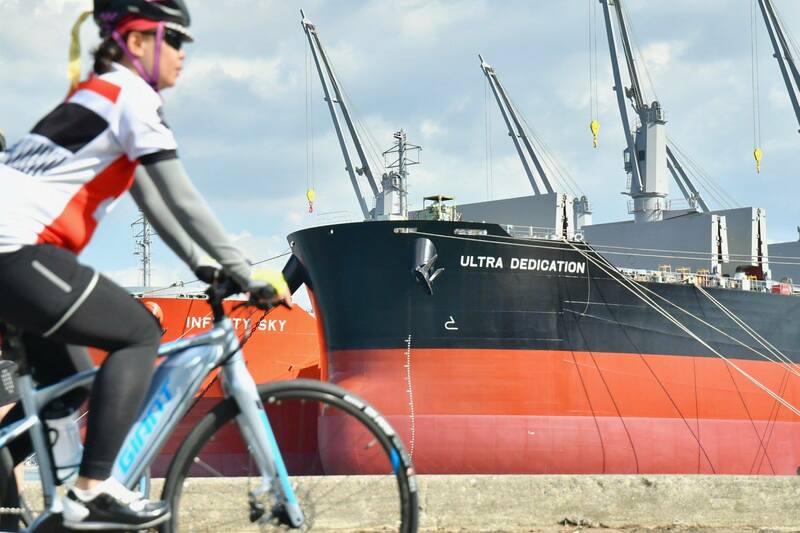 Was this your first cycling tour in Japan? Ans : No, not my first but my 4th time as I have done other part of Japan, such as Lake Biwa, Mount Fuji and Hokkaido. 9. Where are the other countries you have done the cycling tour beside Japan? Ans : Korea, Taiwan and Switzerland. 10. Is this yearly event? Ans : No, this cycling event is 4 years once, in a day. 11. Roughly how much is the cyclist tour cost? 12. Who are the other cyclist members? 13.What is one thing you like about this Shimanami Kaido experience as compared to other destination. 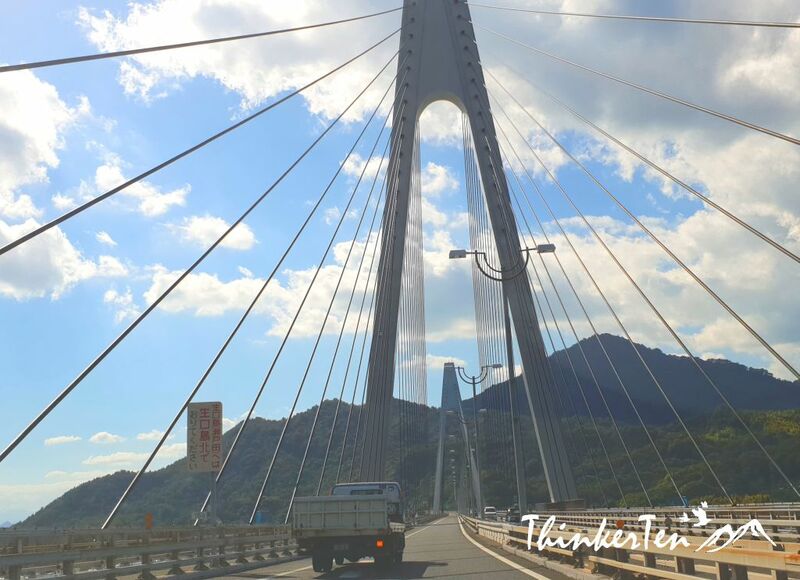 Ans : The scenery along the Seto Inland Sea is breathtaking connecting bridges to bridges in different size and length and each has it own unique style. Another thing I like most is the road users/drivers in Japan are very polite and considerate to give ways. 15. Any other advice or tips you like to share with other cyclists who wish to do Shimanami Kaido? 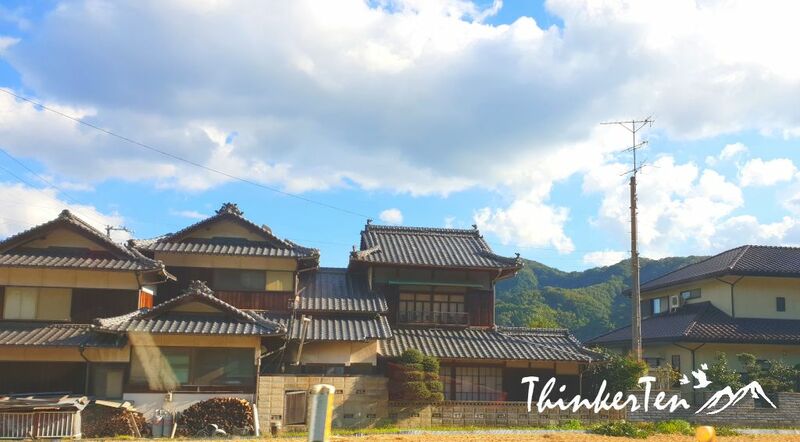 Ans : Break out the journey into 2-3 days instead of one ride all the way through in a day, stop more often along the way to enjoy the scenery and Japanese traditional snacks. I noticed there are plenty of temporary white tenth set up in the Rose Garden for the cyclists rest area. 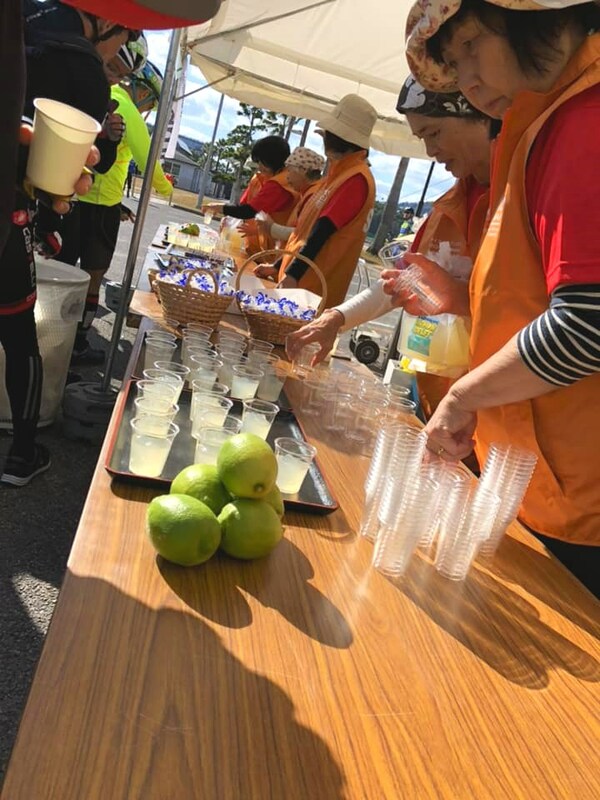 Everything seems to be very well organised and I see plenty of helpers, volunteers or staffs working very hard on the roadside to direct the cyclists along Shimanami Kaido route. As you can see lemon is one of the “meibutsu” famous thing in Seto Inland Sea area so the drinks were served to the tired cyclists. 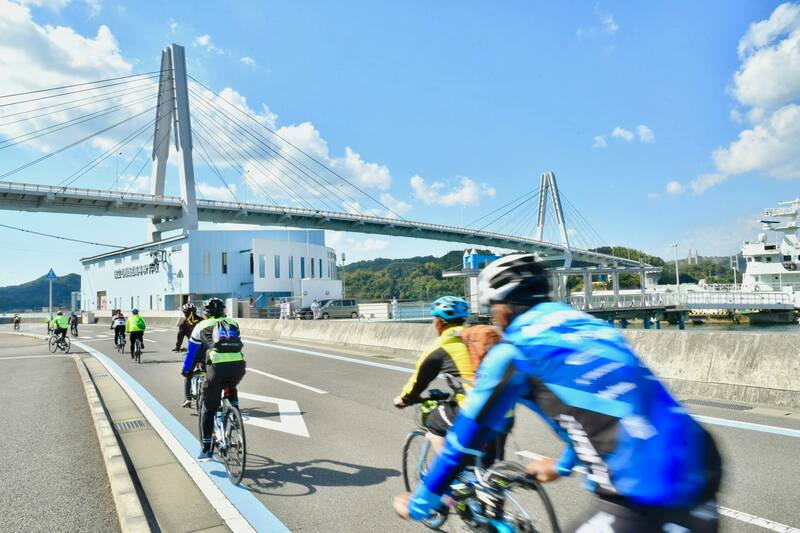 There are two places to rent a bike to do Shimanami Kaido, you can rent a bike from Onomichi too but the bridge that connects Onomichi to Mukaishima is for cars only, so cyclists have to take the ferry. Once you reached Mukashima by ferry you can start your cycling. I notice the first long suspension bridge called Inonoshima Bridge don’t share with cyclists as I didn’t spot any passing through the bridge when we drove pass the bridges. The cyclists are crossing under the bridge at a level below the road that the car use. However, most of the other bridges crossings are sharing with cyclists and cars on the same level. Tatata Bridge 多々羅大橋 (below) – a cable bridge connecting Ikuchijima to Omishima. The steel towers are very high up and shaped like an inverted Y. There are also three very small cable spans. Ikuchi Bridge 生口大橋 (below) – a cable bridge which has two high tower and with inverted V.
Omishima Bridge 大三島大橋 (below) – one of the shortest bridge in Shimanami Kaido but the look is totally different from the rest but quite unique and cute. 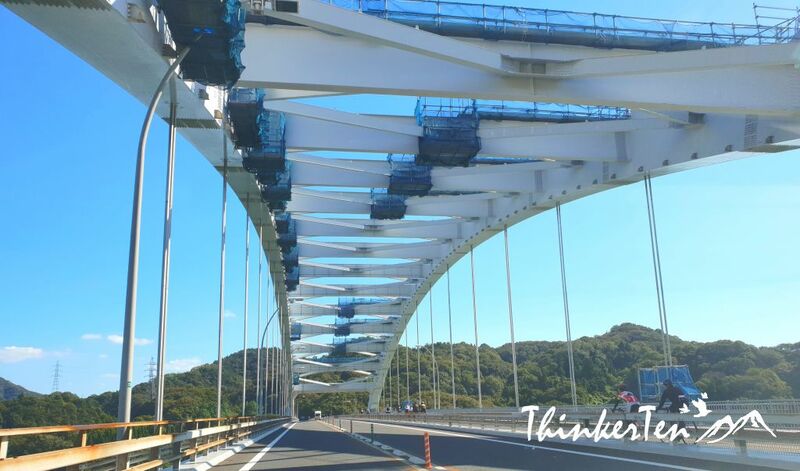 Kurushima-Kaikyo Bridge 来島海峡大橋 (below) – The longest suspension bridge in the world – We capture the best view from Kirosan. 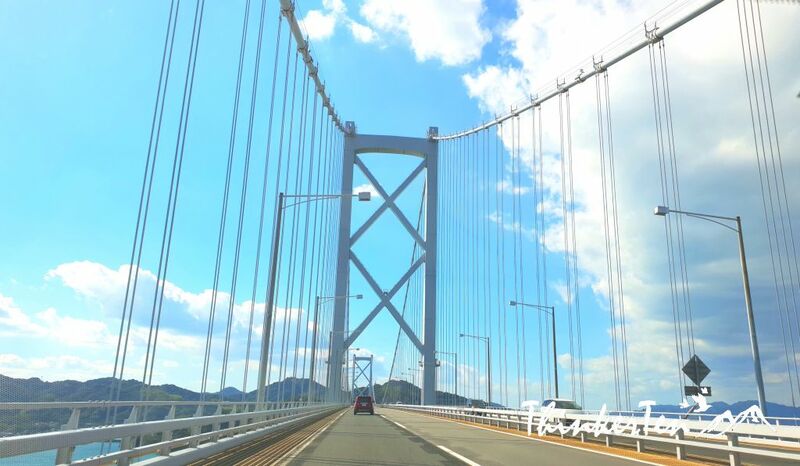 Shimanami Kaido is truly an amazing route connecting Japan mainland Honshu with Shikoku, passing over 6 small islands in the Seto Inland Sea which is famous for it lemon & mandarin citrus fruits. Glad that Lynn was able to share her cyclist experience in Shimanami Kaido route here as my experience was only by car ride. Do it by bicycle is still the ultimate way to go for Shimanami Kaido route if you have the time! Disclaimer : Photos without Thinkerten watermark are photo credit from Lynn. Thank you. I think it is so amazing that people are able to cycle that distance! I have never done anything like that, so I’ll keep cheering from the sidelines, thanks for sharing! What an amazing experience! My dad was an avid cyclist, and did many long tour rides. He would have loved this. This route is an amazing cycyling path for cyclists. There are special path specially made for the cyclists so it is super relax and safer as cycylist do not have to share the path with other motor vehicles. The cyclists uses other way which is even better and offer unblocked view to see Shimanami Kaido. What an amazing tour, the views are simply spectacular! I look forward to cycling more when my kids are older and can go with me. What a brilliant idea to do with kids! What an incredible experience. I think if I chose to visit, I would prefer to try and travel by bicycle as well. Well, you certainly made a wise choice to explore Shimanami Kaido with bikes. Too bad I did not manage to do this route with bike but with rental car only. We have a ton of cyclists here in Seattle, but hadn’t thought about Japan also having cyclists. What an interesting way to explore! Shimanami Kaido is a famous route for the cyclists around the world. Indeed, the best way to explore this city is using a bicycle. You can easily move around and a good exercise as well. You are totally right. With out there are more constraint and some of the routes are through tunnels which is different from where the cyclists used. Cyclists don’t go through the tunnels at all. I would definitely have to train for a bike trip like this, but it would be an incredible adventure. These day they are electric bikes to help the cyclists out. I would certainly love to try that out once with an electric bike to this incredible adventure. This looks like so much fun! I would love to visit Japan and taking part in a cycling tour looks like a great way to see the country. This would be quite an experience. I wouldn’t mind doing something like this and taking in the beautiful scenery. I did it with car but my classmate did it with bike, I am sure it is truly an amazing adventure if it is done with bicycle! This post was very insightful. I love hearing about the cyclist’s experience. One part that struck me was “When they build the route, the purposely have a cyclist path made solely for the cyclists.” I love visiting places that are bike friendly so this is god to know about this area in Japan. I would love to cycle across these islands. So scenic and serene. 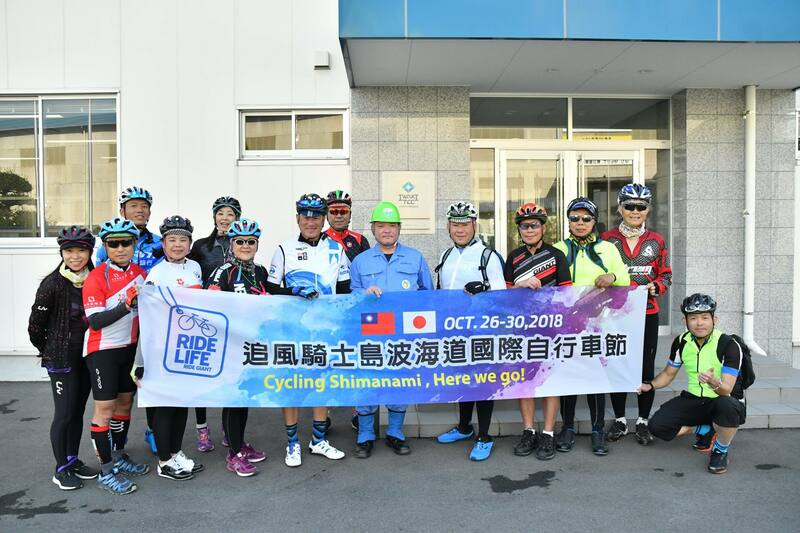 Yes, it is a great experience and Lynn, my high school mate happen to be there when I was travel in Japan and she was so lucky to have the chance to participate the Shimanami Kaido 4 years once event for the cyclist around the world. This is so inspiring! It’s so cool to have friend who is passionate in cycling. But the journey to cycling through the island is so cool. I heard that Japan is bike friendly and I would love to visit near future. Not everywhere in Japan are bike friendly but Shimanami Kaido is 100% bike friendly as there is a separete path made solely for them which is different from the motor vehicles’ driveway. 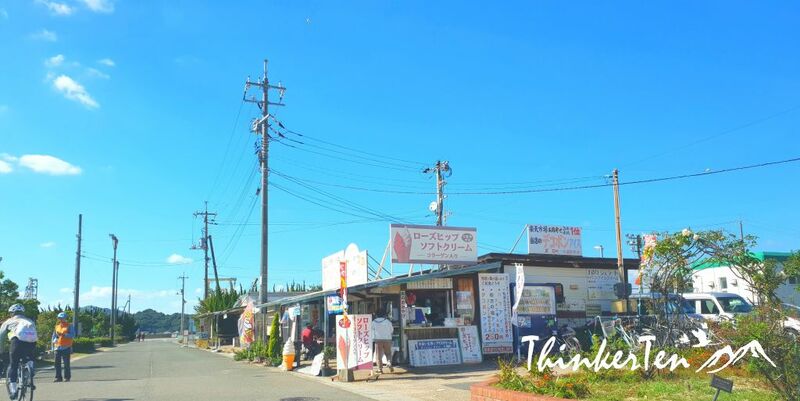 I have actually heard and wrote about this bike circuit in my best things to do in Japan post. I would love to ride on that route, those bridges are so amazing. I am all up for adventure and cycling this route would be part of my future trip to Japan. Yes, the bridges here are amazing! There are several bridges connecting 6 islands from mainland Honshu to all the Shikoku Island. All bridges has it own special unique character and it own names but all togehter it is called Shimanami Kaido. That route looks amazing and the scenery breathtaking. Cycling is such great exercise I hope I still remember how to because the last time I rode anything is when I was 12. 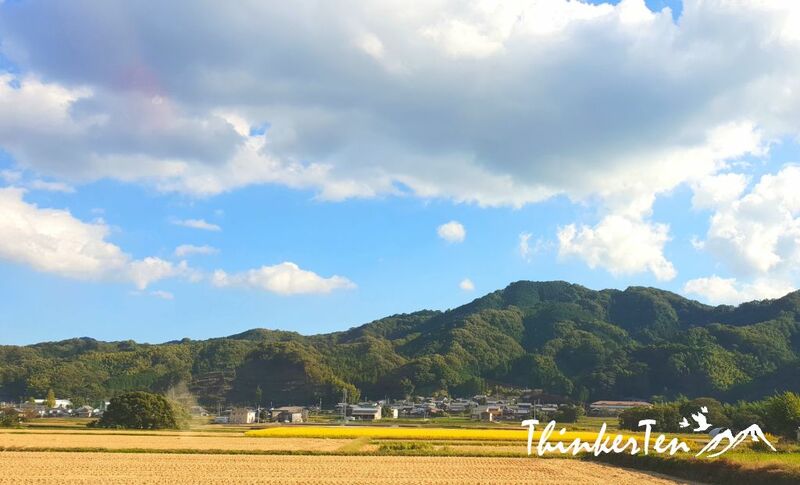 The scenery in that part of Japan with the mountains and the beautiful bridges looks like an ideal location to go cycling! You are right. There even have a special private path made for the cyclists too! I do agree to constantly challenge ourselves to different sport when once we come to plateau. A cycling trip is not on the horizon for me (!) but I would certainly love to visit Japan. Yes, you can do it with free and easy or car too. Japan is a nice place to visit. Wow, I must say it’s amazing. These views are spectacular. The thing that fascinate me is a separate route for cyclist so can enjoy without being disturbed or distracted by other traffic. This trek sounds like such a great challenge! and a great thing to do over summer! and what beautiful views you may come across! Wow! I would love to either run or cycle over that bridge. I am new to cycling and do it in sprint triathlons. That view is just breathtaking. 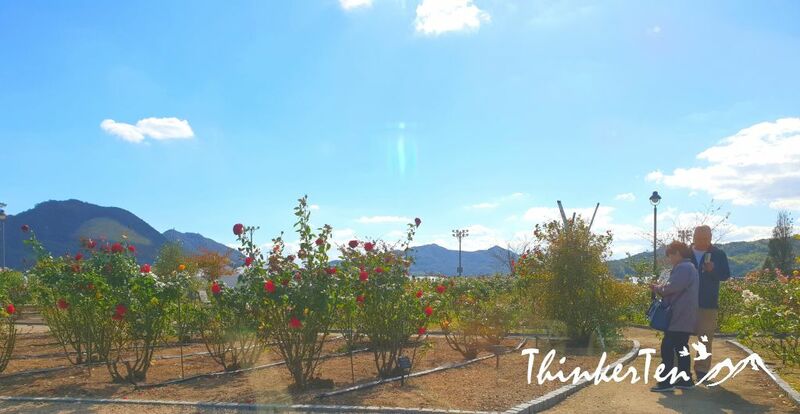 One thing I have learned to love about blogging is connecting with and learning about about other people, cultures, and environments. I was a cyclist before I stopped 3 years ago to move to another country. I find it hard to find a cyclist group that I could join. This looks like a fun activity in Japan. Looking forward that one day I could join that too. I can imagine the discipline and training that cyclists do! It must be very hard. Yes I agree with you Japan is cyclist paradise, Even though I didn’t bike long distance, but I used bike when I was in Japan. Wow what that’s one long route. But the scenery along the way must be spectacular. This sounds like a wonderful experience. I’ve heard that cycling is one of the best ways to truly experience a city. Wow! My husband will love this place. I can’t cycle sadly, unable to balance. Tried a few times but I just can’t. I bet this was a lot of fun. I’ve done cycling trips in Italy, France and Pacific Northwest but never Asia. it’s a great way to see a place! Glad you have done cycling trip in other part of the world and please try once in Shimanami Kaido Japan as there is a special path built for cyclists only.